A group of theatre enthusiasts from Dhaka University have formed the troupe. Before the Dhaka premiere, the play was first staged in Mymensingh last month. The play is based on folk ballads from “Mymensingh Geetika,” which explains why Natyabed staged the premiere in Mymensingh. Roy said that in the late 1980s, Onno Theatre from Kolkata staged “Madhob Malancho Koinna” in Dhaka, which inspired him greatly. He has made some changes in his play though. “Mon Paboner Nao” narrates the tale of a prince named Madhob. He is the youngest of five siblings. After their father's demise, the elder brothers hatch a conspiracy against Madhob because a fortuneteller has disclosed that Madhob will be the next king. Madhob learns of the plot and somehow manages to flee the palace. He takes shelter in a neighbouring kingdom. There he meets Malancho, the princess. Madhob falls for Maloncho but cannot disclose his identity. To add to his woes, the king arranges Maloncho's marriage with another prince. Through many ups and downs, the story ends on a happy note. Mostafizur Rahman enacted the role of Madhob, while Farzana Yasmin played Malancho. 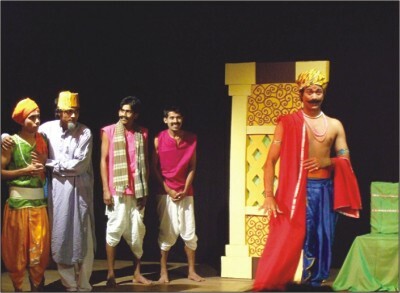 Among others, Mohammad Zahirul Islam, Surobhi Roy, Limon Hossain, Asad Zaman and Nur Islam Tipu performed in the play. The director of the play also did set and light designing for the play. The size of the budget, both development and revenue, is realistic considering the country’s population and economy, but implementation is a big challenge for the government, civil society think-tank Centre for Policy Dialogue said on Friday. “We do not think it’s a big budget. How we can achieve 8 percent growth rate depends on our capacity to implement such a big budget,” Mustafizur Rahman, executive director of the CPD, said in a media briefing at Brac Centre Inn of the capital. The economic growth that has been set at 6.7 percent for the next fiscal year from 5.5 percent for the outgoing year is also achievable, said Rahman. The CPD’s observations came a day after Finance Minister AMA Muhith placed a Tk 1,32,170 crore budget for the fiscal 2010-11. In its analysis the think-tank believes that adequate focus has been given on boosting investment and solving energy and infrastructure problems. But if there is a lack in proper implementation, it may stoke inflation and hurt growth prospects, the research organisation warned. Political parties react to budget: Hard to implement..
BNP General Secretary Khandaker Delwar Hossain termed the proposed budget for the 2010-11 fiscal highly ambitious and shrouded with ambiguity. "The finance minister read out a beautiful essay and made a weave of dreams. The government will not be able to implement the proposed budget for lack of good governance -- just as the last time," he said. Delwar made the comments in a post-budget reaction at the party's central office last night. "Our Chairperson Begum Khaleda Zia placed some proposals before the budget. But there is no reflection of those in the proposed budget," he added. He said people would reject this budget as it would not play any effective role in the people's welfare. The complete official budget reaction would be given later, said Delwar Hossain. BNP standing committee member MK Anwar, Abdul Moyeen Khan and other leaders were present there. President of Workers' Party Rashed Khan Menon termed the budget comprehensive which would accelerate the country's progress. 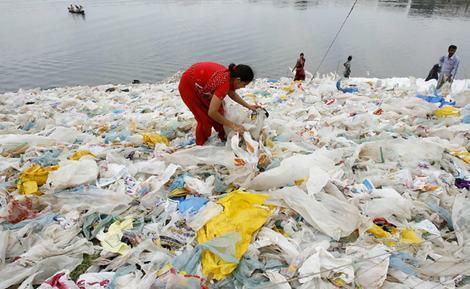 "But its implementation will be the main challenge," he said. Jatiya Party Chairman HM Ershad said it was an ambitious budget and its implementation is possible if the government and administration remain active and sincere. He proposed withdrawal of tax on sugar. 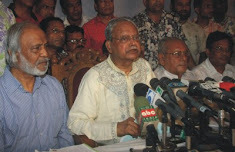 Bangladesh Jamaat-e-Islami General Secretary Ali Ahsan Mohammad Mojahid termed the budget large-scale and impractical. "It is not a good budget because it might face difficulties in implementation. This year we have noticed 52 percent of ADB achieved. It is not satisfying. Implementation of a budget is more important than proposing it," he said. Mojahid observed that the sectors from which resources would be gained are not specified in the budget. Jatiya Party (JP-Manju) Chairman Anwar Hossain Manju said it is an excellent budget. But the government would not be able to implement it due to weakness in administration and tardy implementation of the proposed projects. The finance minister did not say anything about how the lifestyle of people would be upgraded and poverty would be reduced through this budget, Manju said. He also hunched that due to global economic meltdown financial assistance from foreign countries would not be achieved as expected and it would hinder the implementation of the budget. Jatiya Samajtantrik Dal President Hasanul Haque Inu termed the budget development-oriented and farmer-friendly. He said it would help flourish small industries. But the major loophole in the budget is that the government has not reduced tax on information related equipment that will act as a barrier in establishing Digital Bangladesh. He also demanded withdrawal of tax on SIM card and cell phone sets by 12 percent and to decrease tax below 5 percent on telephone equipment. Gonoforum president Dr Kamal Hossain said this budget would help in rural development and improve the country's economy. But the weaknesses must be removed for its proper implementation. Zaker Party Chairman Mostafa Ameer Faisal in a statement termed the budget ambitious. 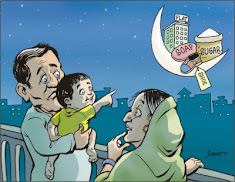 Budget 2010: No relief for middle class.. The traffic jam was terrible. Abidur Rahim thought the budget speech would be over by the time he reached home. He sped up his bike as Mirpur Road was a bit free after passing Agargaon intersection. Luckily, when he reached home the minister was still on TV. Finance Minister AMA Muhith yesterday not only proposed the biggest budget ever of Tk 132,170 crore but also brought a change in presentation. For the first time PowerPoint was used during a budget speech. Abidur, a private firm employee and breadwinner in a four-member family, was following the budget speech for the last two years. "Environment is an extremely important issue of concern for the existence of country's large population," the minister said. Abidur appreciated it. The minister kept on saying many good initiatives for the disabled, acid survivors, widow and old citizens of the country and Abidur's appreciation followed too. Shahana, his wife, joined him watching the budget speech. She asked whether he knew prices of which commodities were going up. "Not yet," Abidur made a brief reply and paid his attention to the TV. The minister proposed zero tariffs on import of rice, wheat, onion, pulse and edible oil, seeds, fertiliser, medicine and cotton. That means no indication of increasing price of these items, Shahana said. "Fifteen percent VAT on import of CBU/diesel/petrol/ CNG buses having 40 seats or more," the speech continued. "If they increase price of big buses, the road will be full of small busses and the traffic jam is going to be worse," Abidur told his wife as he heard experts' comments on talk shows several times. Last year the budget did not fulfill his expectations when an elected government rolled out country's annual financial plan after a two-year break. Like previous years Abidur was keen to know what the democratic government would do for the millions of people in mid-income brackets. "With a view to encouraging investors to build a heavy…," the power snapped at this point. Abidur bought a small IPS a few months ago. But it does not support the television. He found two missed calls at his cellphone when he came out from the washroom after having a shower. Babar, one of his friends, called him. "How do you like the first ever digital budget?" he asked Babar calling him back. "Abid, do you know the price of coconut oil, fruits jam and jelly, juice, medicine, paints, cosmetics, soap, match, mosquito coil, battery, sandal and shoe and electric fan might go up? Babar asked. "I don't know. The electricity snapped," Abid said. "Don't worry. The load-shedding is to go within two years, the minister said." Abid asked his friend, "How much is the tax rate on coconut oil and other goods?" He made this particular question as price hike worried him more than load-shedding. Promise of uninterrupted electricity after two years did not impress him much. "It is not clear yet. But those are coming under compulsory VAT registration. So surely the price will go up," Babar replied. He also said the price of building construction materials like tiles and mosaic would go up soon. Besides, prices of ready-made apartments would also up as new tax is going to be imposed on real estate business. Shahana came back with two cups of tea. The most important thing is price of sugar would go up as the government is going to impose duty on raw sugar. Prices of cigarettes, chocolate milk and chewing tobacco will also increase. "Okay, no problem. I quit cigarette earlier. Now we will cut sugar from our tea to cut the extra expenditure," he said. The two friends agreed that the budget has a number of positive sides as the finance minister is trying to expand the tax net. All of them are needed to net in more funds to fuel his big budget. But one crucial area remained neglected in the budget speech -- corruption. The minister said nothing to check corruption. Hanging the phone up, Abid thought he would better read tomorrow's newspapers to have a clear conception of what this budget might mean to people like him. Big budget, few new ideas: Harsh VAT to make consumer products pricey.. If anybody expected even a few innovations in budgeting this year, they must have been rather disappointed. For Finance Minister AMA Muhith yesterday presented a budget that dwells mostly on past initiatives, and wants to carry on the unfinished agenda. However, the agenda his party ruling Awami League served to voters is so huge that any budget would have little room for new things. Muhith wanted a much higher growth of 6.7 percent for the next fiscal year, and for that he had to plan a bigger investment, mostly in power and infrastructure. Much of his optimism came from recently emerged good figures that he quoted in the budget speech -- higher capital machinery and raw material imports, higher remittance flow, strong current account surplus, and more private credit supply. Naturally, his major challenge emerged in revenue collection. Whether he can collect so much fund, is a question hanging in the balance. This year's impressive revenue collection may make one optimistic. But aiming at a big increase over a big benchmark may prove difficult. In his effort to rake in higher revenue, the finance minister withdrew truncated value added tax (VAT) and tariff value on a plethora of consumer products and services, which will ultimately affect middle and upper income group people. The proposed budget envisages a big total expenditure of about 20 percent. The Annual Development Programme (ADP) is projected to increase by a huge 35 percent from this fiscal year's revised budget. This would need a much improved implementation capacity of the government. However, Muhith did not mention much about that capacity enhancement. Any mismatch in these arenas would certainly take a toll on his growth figure. This big budget would also pose the challenge of balancing budgetary policy with monetary policy, in order to tackle inflation that is already on a rising curve. The high expenditure is likely to fuel inflation further. The government's thrust for infrastructure and power would bring in more money than one can imagine on the market, and private sector credit would increase too. All that may pose a tricky situation for the finance minister. In the proposed budget, Muhith wisely kept Tk 2,000 crore stimulus package for industry, to overcome the aftermath of the recession. This looks like a sound policy stance in the face of the global trend of phasing out stimulus now, as big competitors like China and Vietnam, which received even higher stimulus, are now much strongly posed in the global market. China is even entering Bangladesh's low-end product market. One place from where a part of Muhith's growth will come is the private-public partnership (PPP) initiative which could not take off this fiscal year. But he mentioned in the budget speech that the guideline for PPP has been readied, and he proposed Tk 3,000 crore for the initiative. 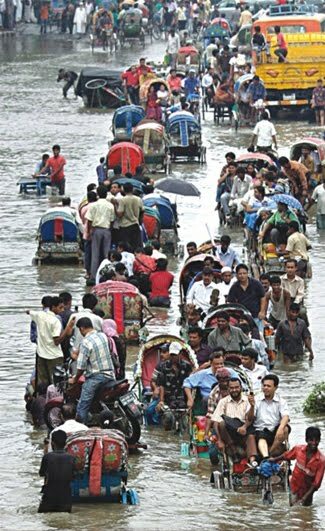 This along with the Bangladesh Infrastructure Finance Fund of Tk 1,600 crore would "hopefully" meet the infrastructure needs. The finance minister earmarked power as the top priority sector with a 60 percent higher allocation, and outlined the path to scale up generation. He then prioritised some other sectors too, such as shipbuilding, light engineering, and pharmaceuticals. However, it was not clear how these sectors are going to be benefited from being identified as thrust sectors. This has happened because the industrial policy could not be finalised, and a guideline could not be formulated before the budget. Agriculture has always been the saving grace for the country when other sectors failed. This year also proved to be the same. The proposed budget recognised this contribution of agriculture, but perhaps one would feel that the sector deserved better attention. The proposed subsidy for the next fiscal year is lower than what has been distributed this year, irrigation received poor attention, and farm credit for the next fiscal year is just minimally higher. If surface water utilisation is high in priority, dredging of rivers received little attention. The budget also could have given a better employment plan. Merely saying new roads and hat-bazars would be built to generate jobs, leaves much to be desired. Also the employment generation estimate for this year (526 lakh man months), and the next year (621 lakh man months) could be more elaborate. One area that the finance minister explicitly mentioned, was his plan for privatisation. His commitment that industries which have been sick for 15 years, without any likelihood of being "effective", must exit -- would rightly serve the purpose of saving crucial public fund. But two crucial areas remain badly neglected in the budget speech -- financial reforms and corruption. One gets no idea of what reforms are on cards for banks. The anti-corruption chapter was probably inserted just for the sake of recognising its existence. In the tax chapter, the finance minister proposed a lot of reforms and changes in revenue administration and processes. All of those are needed to net in more funds to fuel his big budget. He proposed to retain regulatory duty on highest slab products, to save the local industry. He also tried to help small and medium enterprises by increasing the ceiling for 4 percent turnover tax -- from Tk 40 lakh to Tk 60 lakh. However, the logic of taking away the opportunity given to small businesses to pay VAT at a low fixed rate, is hard to understand. And so is not factoring in the effect of inflation on income tax slabs. DHAKA is expanding in all directions. The city's master plan, the Dhaka Metropolitan Development Plan (DMDP), has two parts. The Dhaka Structure Plan is valid from 1995-2015, whereas the Urban Area Plan was valid from 1995-2005. 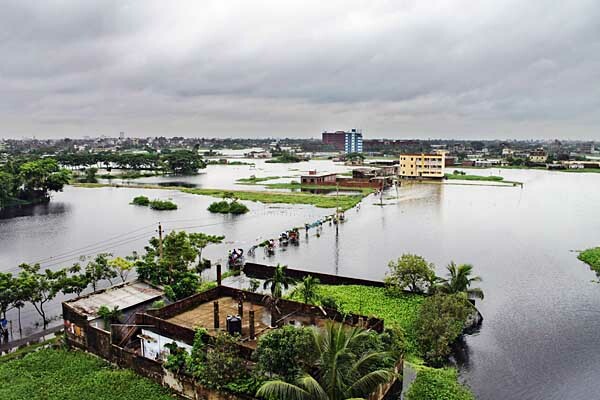 The plan considers keeping at least eight flood-flow zones undisturbed -- Dhaka West, DND Triangle, Eastern Fringe polders, Kamrangir Char, Jinjira, Narayanganj West, Dhaka NW, and Narayanganj East. Unfortunately, this is not happening. Already, unscrupulous developers have filled a number of flood-flow zones, something that Rajuk has failed to prevent (Ferdousi, 2006). Low-lying areas and flood-flow zones are encroached by both public and private sector-initiated housing projects. Flora and fauna are decreasing, cultivable land area is shrinking, and crop production has come down by a considerable amount over the decades (Rahman, 2007). The city's eastern part regularly goes under water during the rainy season. This part also holds rainwater runoff for a large part of the city through natural drains. During the last decade, about 19 housing projects were initiated in the eastern fringe. It is expected that all housing projects will be implemented in the next 10 years. Most of these estates were developed by filling low land with sand, soil and solid waste. An analysis of IRS image of 1996 and IRS image of 2000 clearly shows that water bodies measuring about 2,300 sq. metres were filled in during the development of Bashundhara and Bashumoti housing estates. Similarly, for Aftabnagar Housing branches of natural drains and large water bodies, covering an area of 66 acres, were lost due to housing development. In the southern part of Buriganga river, Rajuk (the capital development authority) initiated a residential project on an area of 381 acres. The project site used to remain under water most of the year. 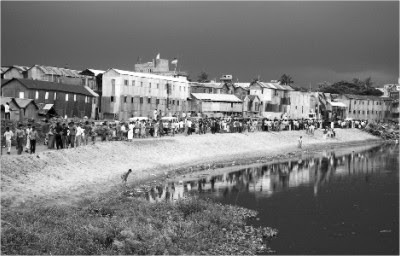 The site is demarcated as a water-retention pond in the Dhaka Master Plan. Over the last two years, this area was filled for a housing development. Apart from this, about 3,000 sq. metres of natural water bodies have already disappeared during the Riverview Housing Estate development on the Buriganga River bank's southern fringe (Rahman, 2007). In western Dhaka, housing estates were initiated over the last two decades. In 1996, there were 211 acres of water bodies in the Mohammedia housing estate and Adabbor area. During development, about 91 acres of water bodies disappeared between 1996 and 2006 and 68 acres between 2006 and 2009. Since Dhaka is developing fast, and without proper guidance, we may see more cases like the June 1 Begunbari building collapse -- where buildings are constructed on marshy land -- or during an earthquake where soil liquefaction may devastate the city. Liquefaction is a physical process of ground failure that takes place during some earthquakes. Because of liquefaction, soft, young, water-saturated, well-sorted, fine grain sands and silt behave as viscous fluids, rather than solids. If pore-space water pressure increases to the point where the soil's shear strength no longer supports the weight of the overlying soil, buildings, roads, houses, etc., then the soil flows like a liquid and causes extensive surface damage. On September 19, 1985, an earthquake struck Mexico City, with a magnitude of 8.1 on the Richter scale. The earthquake's epicenter was 240 miles from the city. Since Mexico City is situated on land once covered by Lake Texcoco and was filled in for habitation, hundreds of city buildings collapsed due to the heavy shaking of the ground and the quake's long duration, which lasted three to four minutes. Similarly, for the Niigata earthquake and the Alaska earthquake, also of 1964, liquefaction phenomena devastated the cities. Hundreds of buildings collapsed and were damaged due to its affects. A recent study by Comprehensive Disaster Management Program (CDMP) on the liquefaction susceptibility of Dhaka indicates that the city's eastern and southwestern parts lie within the high to very high liquefaction susceptibility range. These parts are recently filled and developed marshy lands. The CDMP study also identified several active faults within Bangladesh, based on historical events and evidence from geological investigations. The Madhupur and Dauki faults, about 90 and 230 miles, respectively, from Dhaka, are those identified by experts. The 1985 Mexico City earthquake caused a considerable amount of damage, even though the source was 240 miles from the city. In Dhaka, an earthquake from either Madhupur or Dauki may cause severe liquefaction effects to buildings, especially those developed on marshy lands on the eastern and western fringes, and even within the city in the infill areas like Begunbari, part of Mirpur etc. Proper land-use control mechanism is required to ensure Dhaka's future development, considering the possible liquefaction effects of earthquakes. In-depth studies and research in this regard would be helpful for the preparing Dhaka's development in the coming decade. 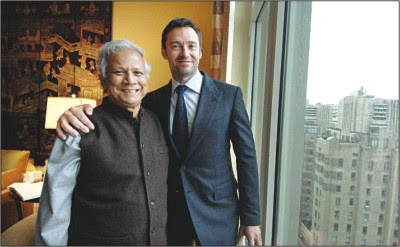 Entertainment: Hugh Jackman met Professor Yunus..
Hollywood superstar Hugh Jackman and his wife Deborra-Lee attended the Grameen America reception in New York recently to mark the opening of its Manhattan branch, according to a press release. Jackman is a strong supporter of Nobel Laureate Professor Muhammad Yunus and a longtime advocate of microcredit. The actor has made a commitment to promote Yunus's work on social business. Professor Yunus invited Jackman to visit Bangladesh. Jackman assured him that he'd come to Bangladesh as soon as his schedule permits. Entertainment: Actress Sharmin Sheila giving makeovers..
Actress Sharmin Sheila has started a new venture: a beauty parlour named “Sheila's Makeover”. The parlour, located at Muhammadpur, is drawing people by the droves because of her reputation as a superb actress. Sharmin counts as her clients many well known actresses also. Sharmin has her hands full at the moment. Two of her serials are being aired on ATN Bangla and Bangla-vision. “Nondini” is directed by Sayed Awlad, while “ Patiganoti” is directed by Sezan Masud. Her role as Sadiya in the popular drama serial “Bondhon” still remain etched in the memory of the audience. Many people dub her new venture as Sadiya's beauty parlour. The crowning glory: Grand finale of “Meridian Channel i Khudey Gaan Raaj” tonight..
“Meridian Channel i Khudey Gaan Raaj,” Channel i's musical talent hunt for youngsters, wraps up with a grand finale at Bangabandhu National Stadium tonight. This year's “Khudey Gaan Raaj” promises to go out with a bang, as the finale is most likely to be full of surprises, informed the organisers. Channel i will air the entire show live, starting from 7:30 pm. With the grand finale just hours away, what are the young contestants thinking? How are they preparing and devising the final strategy that would win the title of 'Khudey Gaan Raaj'? This correspondent visited 'Shopnopuri,' the official camp of “Khudey Gaan Raaj.” Set up at the Channel i Tejgaon centre, the camp is currently housing the finalists -- Anonna Raj, Tanisha Islam Sheniz, Nusrat Zuhuri Pranti, Apurbo Basona and Raju Ahmed Rana. Nervous and excited, the top five seemed happy enough sharing their plans. “Tonight is certainly a big night for me,” said Anonna Raj. Anonna is from Rajshahi and is optimistic about winning the title. “Whatever the outcome may be, to be able to make it to the final is a great achievement for me,” said Anonna. “When I grow up I want to be a doctor as well as a singer,” said Anonna, a student of class eight at Govt P.N. Girls High School, Rajshahi. Tanisha Islam Sheniz is from Sirajganj. Tanisha is a student of standard eight at Sirajganj Collectorate School and College. “Tonight I might feel a little nervous; performing live in front of so many people isn't really something easy. But when I take the stage, I will try to deliver my best,” said Tanisha. Tanisha is grateful to her parents -- AKM Zahurul Islam and Aliza Perveen -- for their continuous support. “I would like to become a doctor and pursue singing as well. I'm interested in fashion designing too,” she said. Apurbo Bashona is from Jamalpur. She is studying in class three at Holy Mission School and College. “Excited and at the same time very nervous,” said Bashona. “If I win the title, it will be great. If I don't, well, I will still be happy and thank the Almighty for letting me make it to the top,” said Bashona. Bashona wants to study medicine in future. The fifth finalist is Raju Ahmed Rana. For Raju “Khudey Gaan Raaj” still seems like a dream. Born to a disadvantaged family in Satkhira, Raju used to sing on the streets. He would buy rice with whatever he earned and take that home. “If I didn't sing, we wouldn't have had food for the night,” said Raju. His father Abdul Latif Sardar is a day labourer and his mother, a domestic worker. “Things turned really bad for us when my father suffered a serious injury and was no longer able to work. Desperation forced me to sing on the streets,” said Rana, who is nine years old. “If I win the contest, I will get us a house first. We have no house; we live in a hut. I'll use the rest of the money to go to school,” said Rana. The winner of “Meridian Channel i Khudey Gaan Raaj” will receive a cash prize of Taka 5 lakh. The first runner up will receive Taka 3 lakh and second runner up will win Taka 2 lakh. 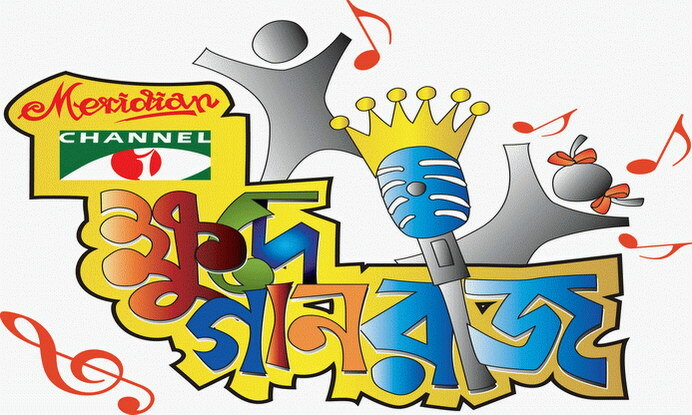 Bangabandhu National Stadium will be open to all for the finale, informed the organisers. Khaleda tells sit-in that agitation to start if EC fails Ctg city polls test; warns govt of dire consequences if it skips democratic path, cautions intelligences against 'oppression'; says no pardon for Fakhruddin, Moeen, few others..
BNP Chairperson Khaleda Zia yesterday warned of launching a countrywide mass movement against the government from the polling day if any rigging occurs in the Chittagong City Corporation Election. The CCC polls will be a real test for the Election Commission to prove its neutrality, said Khaleda, the leader of the opposition, at a mass sit-in organised by BNP on the premises of Institution of Engineers, Bangladesh in the capital. She said the government must get back to the path to democracy and follow the rule of law; otherwise it will face dire consequences. "We won't tolerate any more oppression by the government. If attacked, we will retaliate," she said. The former premier said they would have to go for tough programmes if the government does not change its attitude. Khaleda warned the intelligence agencies and Bangladesh Television (BTV) about playing a partisan role. She also criticised human rights organisation for keeping silent about the "repression on the opposition." The mass sit-in, the first anti-government programme since the December 2008 election, was organised to protest against "the government's interference in judiciary" and "appointment of incompetent and controversial persons as justices." BNP's alliance partner Jamaat-e-Islami, Bangladesh Jatiya Party, Islami Oikya Jote and a number of like-minded political parties, professional bodies and personalities participated in the programme for the first time after January 2007. Hundreds of supporters of the opposition took position on the road in front of the Engineers' Institution causing severe traffic congestion in the area. They chanted anti-government slogans during the four-hour sit-in that began at 10:00am. Loudspeakers and large screens had been installed at different points from Shahbagh to Kadamful Chattar. Calling for the resignation of the election commission, the BNP chief said it created a rift in BNP during the tenure of the last caretaker government. Khaleda said the overzealous members of intelligence agencies, who are arresting and torturing opposition activists, will face grave consequences for their partisan role. "You [the members of intelligence agencies] may have to face remand one day. Be alert and careful," said the former prime minister. She again came down hard on former chief adviser Fakhruddin Ahmed and former army chief Moeen U Ahmed. The leader of the opposition said all [in the army] except Moeen, and a few others along with Fakhruddin, will be pardoned. "I have no grievance against the army as only a few people including Moeen Uddin committed crimes. If you [army personnel] give deposition that Moeen and a few others had committed the offences, you will be pardoned." Khaleda protested against the shutdown of Amar Desh and the arrest of its acting Editor Mahmudur Rahman. Media houses are being shut for telling the truth, she said. The BNP chairperson said if BNP is voted back to power, those sacked by the present government will get their jobs back while the "partisan cadres" being appointed now will lose their jobs. "The government has taught us this lesson and we will follow it in future," she said. The BNP chairperson said she placed a budget proposal for the good of the present government that termed it unconstitutional. "The government is violating the constitution time and again," Khaleda alleged. Referring to the 1986 elections, she asked, "Wasn't it a violation of the constitution when they convened parliament at the South Plaza of Sangsad Bhaban after losing the polls, stage-managed by the then military dictator HM Ershad?" The leader of the opposition urged judges to maintain neutrality, saying they need not worry, as people will be with them if they ensure justice. She said if voted to power again, they would set up a Supreme Court secretariat. Khaleda alleged that BTV telecast "false" news about her and her sons. "None will be able to protect those who are doing these against me and my sons." Criticising human rights bodies, the former premier said they created uproar in Dinajpur over the murder of a girl when BNP was in power. But now they remain silent about the repression on the opposition by the ruling party. "I want to know the reason behind their silence." She demanded immediate release of Mahmudur Rahman, BNP leaders Lutfozzaman Babar, Abdus Salam Pintu and Nasiruddin Pintu. Khaleda Zia called upon all to make the June 27 hartal a success. She said the hartal was not called for the benefits of her party or herself but for bringing an end to people's sufferings. BNP leaders Khandaker Delwar Hossain, Moudud Ahmed, Shawkat Mahmud, Jamaat leaders Matiur Rahman Nizami and Ali Ahsan Muhammad Mojaheed, Andaleeve Rahman Partha of BJP, Shafiul Alam Prodhan of Jagpa, among others, spoke. Opposition Chief Whip Zainul Abdin Farrooque and Jubo Dal president Moazzem Hossain Alal moderated the programme. Nimtoli Tragedy: Gano Bhaban hosts wedding of 3 victims..
Three weddings with a difference: they all played out in the shadows of sadness. The only silver lining was the role of a woman, who was none other than the prime minister. 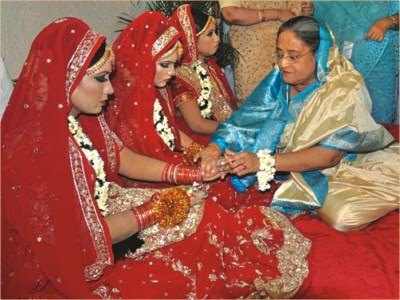 Sheikh Hasina last night married three girls off at a low-key ceremony at Gano Bhaban. Two of the girls were orphaned by the June 3 building blaze in Old Dhaka. The third lost her mother to the inferno. Her father is fighting for life in hospital. It was Hasina who came to their lives as mother. She bought for them ornaments, saris, and all other thing necessary for a wedding. This was the first time that the wedding of any girl is completed at Gono Bhaban in presence of a prime minister. Hasina adorned the three girls with gold ornaments and blessed them. Sakina Aktar Ratna, her younger sister Faroa Akhtar Runa and Asma Akhtar lost most of their family members in the Nimtoli fire on June 3. Ratna tied the knot with Saidur Rahman Suman, Runa with Mohammad Jamil and Asma with Mohammad Alamgir. The three girls and Jamil lost their mothers and other family members. "I'm missing my younger brother Anik. After losing our dear ones, I'm quite happy today that the prime minister has come to our lives as a close kin," Suman said after the wedding. Jamil said he missed his mother and other family members on such a happy occasion. Alamgir, who married Asma, sought everyone's blessing for a happy married life. A special prayer was offered at 11:30pm for the salvation of the departed souls of the members of the four families. Awami League leaders Mofazzal Hossain Chowdhury Maya, MA Aziz, Hazi Mohammad Selim, Mostafa Jalal Mohiuddin took the bridegrooms to the stage at the conference hall of Gano Bhaban at about 9:30pm. However, the wedding ceremony was scheduled for 7:00pm. Local AL lawmaker Jalal said the weddings were arranged just a week after the devastating fire as there was no religious restriction and the families of the brides and bridegrooms agreed to complete the weddings as soon as possible.